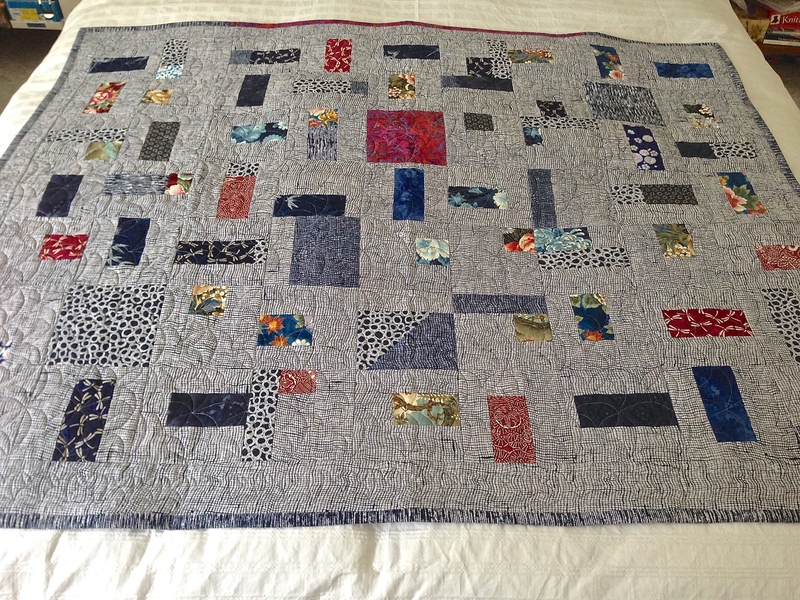 This is the quilt I’d been working on before my San Francisco trip. I’d got the piecing done both front and back, had pinned the quilt sandwich and had managed to quilt 24 of 36 embroidery repeats for the quilting. I had no time between returning from San Francisco and my wrist surgery so the unfinished quilt has been sitting on my cutting table taunting me. This week I decided to see if I could manage to position the embroidery hoop on the quilt – I knew the actual sewing wouldn’t be a problem for my hand but applying the hoop mostly using my left hand I wasn’t so sure about. 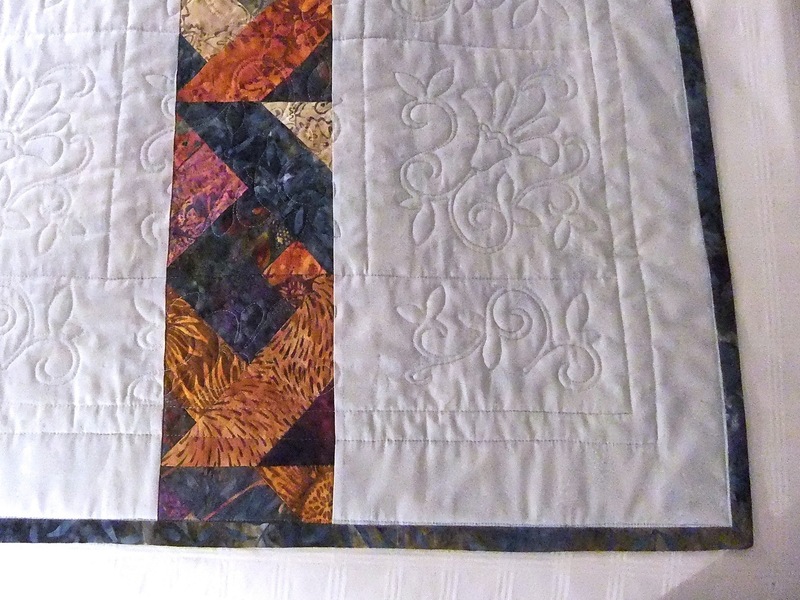 Turns out I was able to position and tighten the hoop fine so I did a couple of quilting embroideries – then then next day five more, and yesterday I finished up the remaining quilting. This morning I created a label for the back and added the binding. So now the quilt is completed. The back is an improvisation – I created a strip of triangular (actually trapezoidal) pieces from the fabrics used to piece the front, done with sashing between the pieces and separating the strip from the backing fabric. 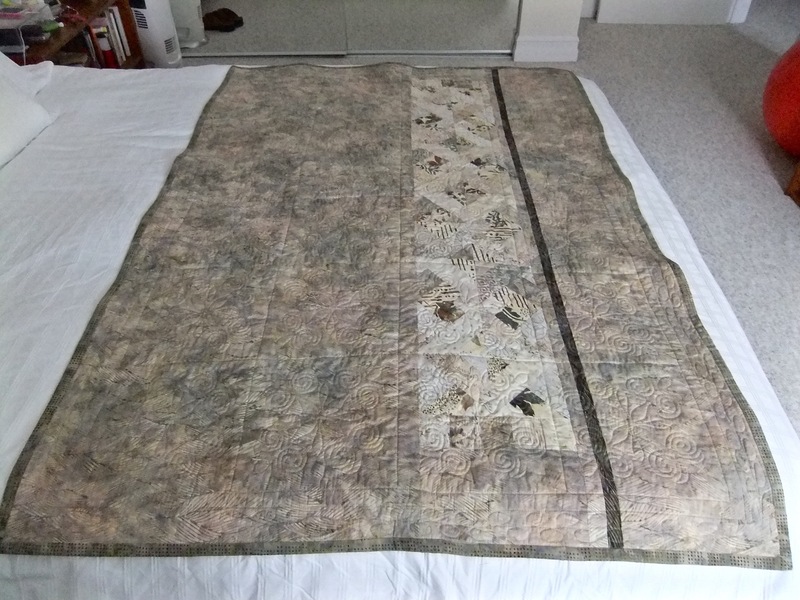 I needed a 9″ strip for the backing to be wide enough for the quilt – this was the easiest way to do that. This insert creates a strong, bold contrast to the backing. 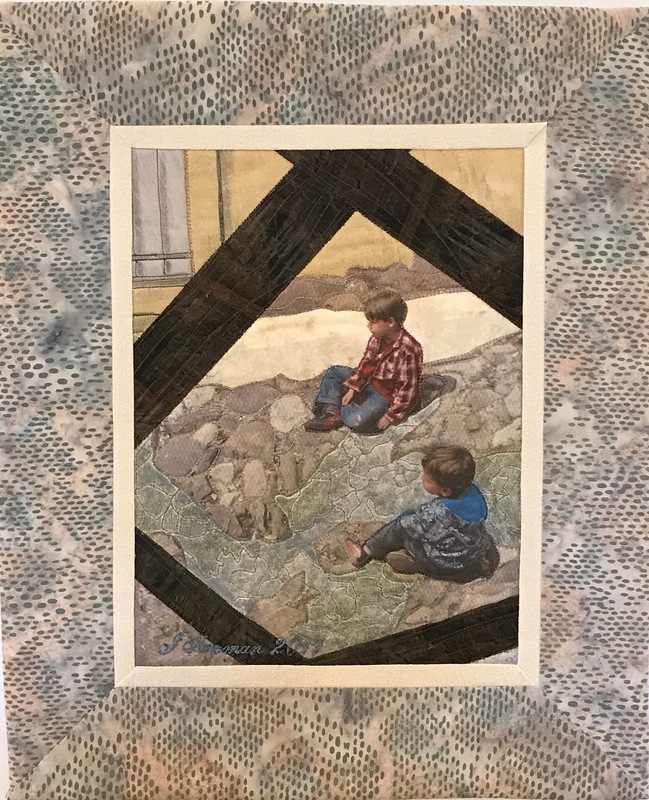 My next project will have to be a couple of small art/landscape pieces – by small I mean 10″ x 12″ or so, for a class I’ll be teaching starting June 6. I need to get a couple of different pieces underway so I can demonstrate a variety of techniques people can use for creating textile art. 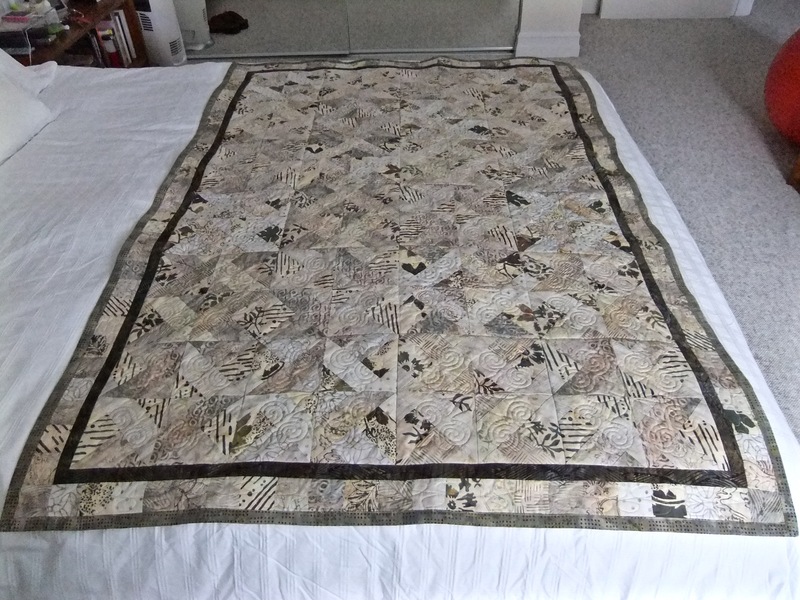 Having just finished the half square triangles quilt I wanted to link to the “magic squares” quilts – I did three of them but it seems I only wrote about one of them. So I thought it would be interesting to juxtapose all three of those quilts. This quilt was made from leftover jellyroll strips (I had a collection in shades of blue/turquoise and rust/gold/beige)- sewed 4 strips together not paying much attention to the colours I was picking up as I went along, cut the panels into 8 1/2″ blocks, put two blocks right sides together (strips at right angles), sewed around the outside, cut along the two diagonals – resulting blocks were 4 1/2″. I arranged them on the diagonal being careful to alternate the orientation of the blocks to get both pinwheels and squares. Added background triangles to square off the edges and two borders – a narrow one and a wider one. The quilt back was the same fabric used for the background on the front with an added strip created from leftover blocks so the back would be wide enough. While I was finishing this quilt I could see quite a few other possibilities for layout and contrast so I did a second quilt using the same technique – cutting 2 1/2″ strips from a “scrap bag” I’d bought from Keepsake Quilting (each scrap bag contains twelve 9″ width of fabric strips in complementary fabrics). In this quilt the fabrics are subdued, all in a single pallet, with two fabrics of a bolder pattern giving some contrast. 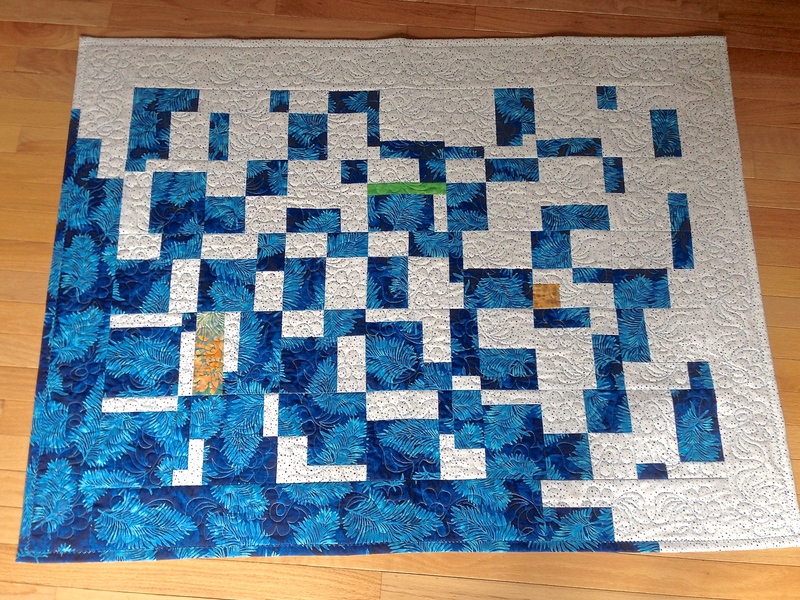 This time, I stitched the 4 1/2″ blocks on the straight which gave quite a different overall effect. On the back, in addition to the pieced strip, I added a narrow contrast strip just to create a bit more definition on that side. 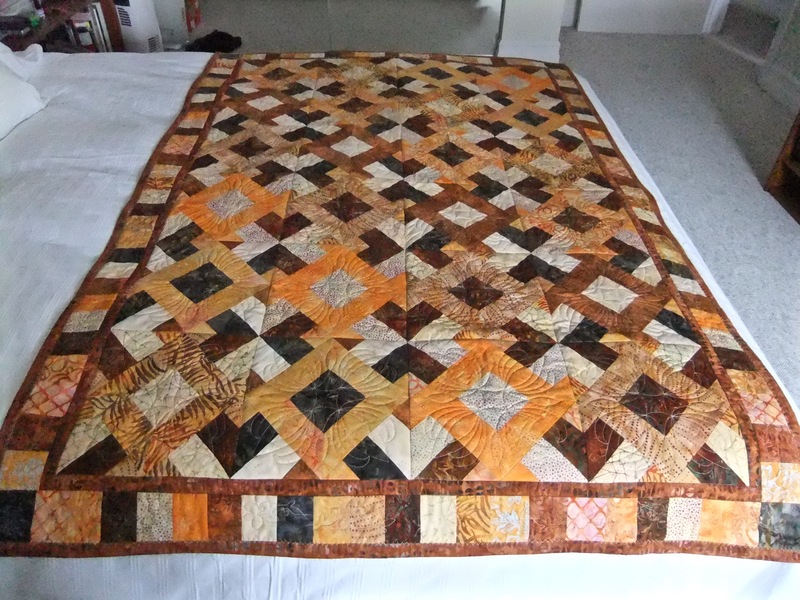 This quilt was made from another “scrap bag” – the fabrics this time were in shades of rust, brown and beige (I did have to swap out a couple of the fabrics from the scrap bag for something else in my stash that coordinated better with the set). Again, I arranged the 4 1/2″ blocks in straight rows (9 blocks in a row) taking care to stagger the resulting larger blocks, which formed squares, in rows that created a noticeable diagonal – you can see that in the photo if you follow the orange squares from the middle left to the bottom. To make the quilt the final size I wanted I added a narrow border of the backing fabric, and a wider border pieced from the fabrics used in the blocks. The back consisted of a wide strip created from leftover blocks, a 1″ sashing of backing fabric on each side and two contrasting stripes. The way in which the blocks were constructed is obscured by the final layout – so a simple technique produced a rather complex design! 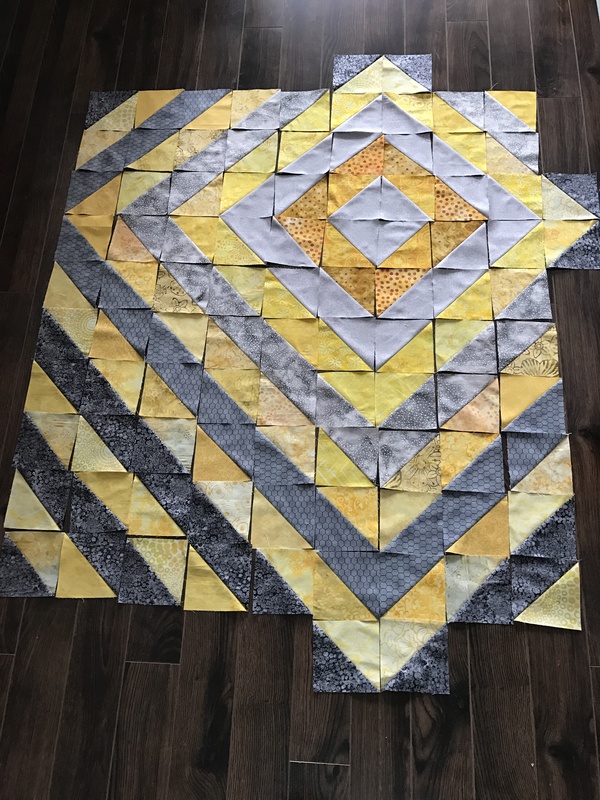 I can think of many more possibilities with this “magic squares” technique – just depends on the range of colours used for the strips and the layout of the resulting blocks. 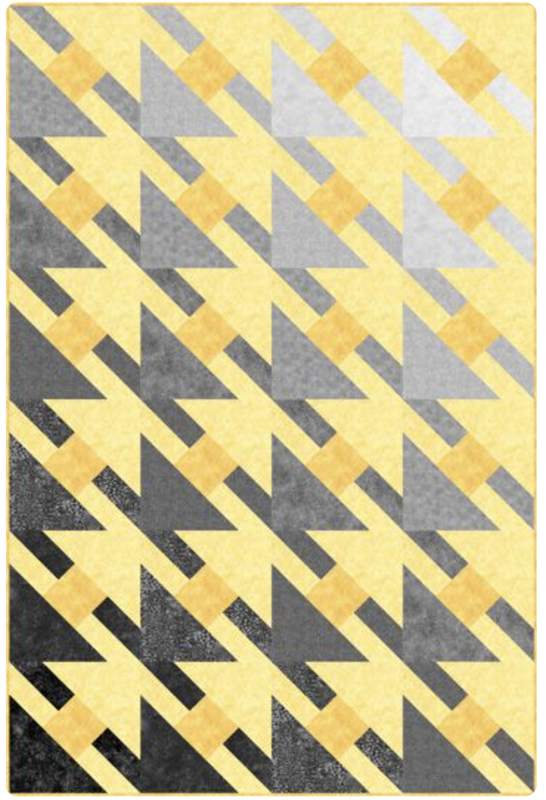 I haven’t tried it, but I wonder what the design would be like if instead of cutting along the diagonal, after sewing two 8 1/2″ blocks together, I cut unequal blocks on the horizontal and vertical? I need to look at the jellyrolls I have and think about what I might do with them. Finally done. I’ve been working on this quilt for a couple of weeks now. It started out as an unequal 4-patch based on an idea for a charm pack (5 X 5 squares). I used the fabrics I bought at the Kaffe Fassett lecture in the spring. I cut and sewed the 4-patch blocks but they were too small for a 5 x 7 quilt – I needed to add fabric so I added another layer on the edge. BUT I cut the strips too narrow – the blocks were still too small for the final dimensions I was after. So I decided, rather than just add sashing, to add triangles around each block which resulted in a “tilted” block. Seventeen blocks tilt in one direction, eighteen tilt in the other. So I had to lay out the blocks in the order I wanted them and add the correct triangles to each so that the layout I was after would be in the finished quilt top. Finally I added a 3″ border around the outside. 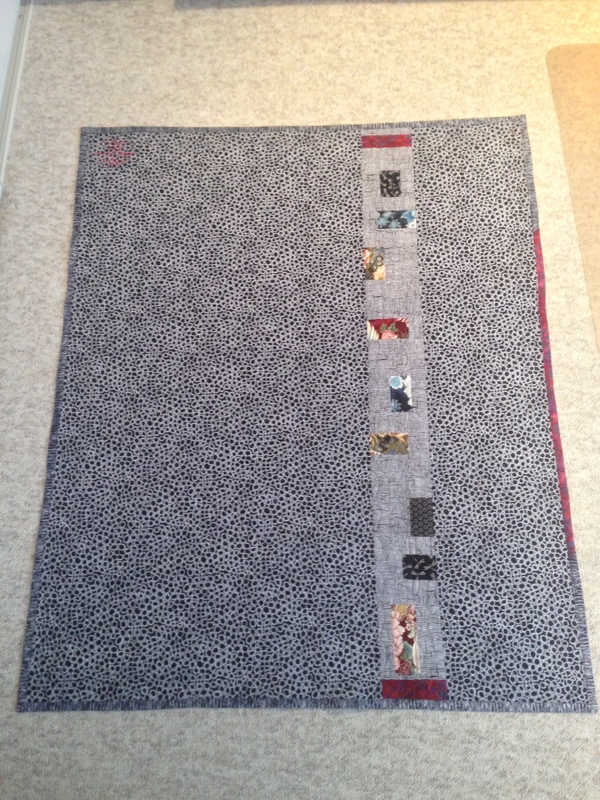 The finished lap quilt will be 48″ x 65″. 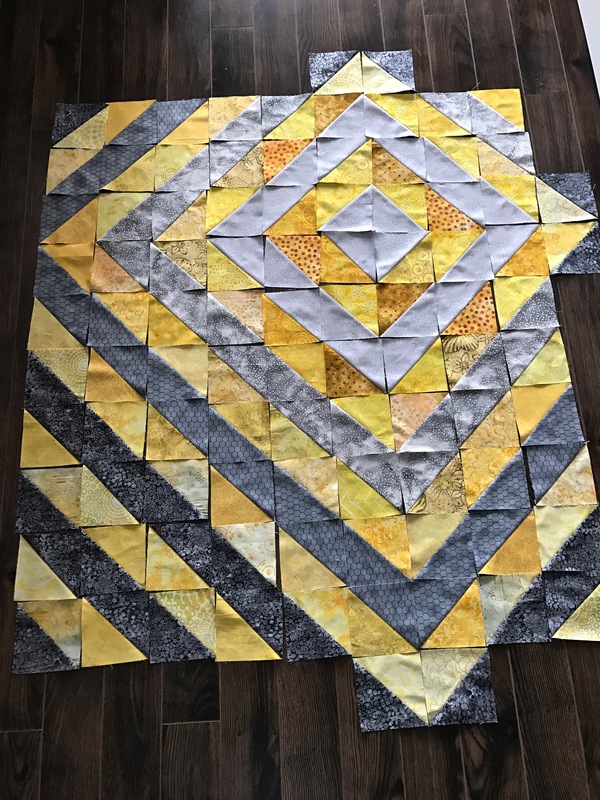 I worked out the triangles by trial and error – I wanted the tilted block to end up 8.5″ wide – in the end that meant I needed a triangle cut on the diagonal of a 2 1/4″ x 9 3/5″ rectangle. Applying the triangles is tricky – can’t chain the sewing – each block has to be done individually – the first strip is partially sewn on, then the other three sides are added, and then the first side is stitched to the end – that’s necessary to get all the triangles sewn in place equally. In the end, it wasn’t applying the triangles that was difficult, it was sewing the blocks together – I didn’t quite manage to get all the points to align perfectly. But once the top is stitched in the ditch and quilted that isn’t going to show – only a very experienced quilter is going to notice that detail! These are the blocks before triangles (just the block in the upper left has triangles added). Here is the first of the Joe Cunningham quilts – he calls the idea “The Three Crazy Sisters“. 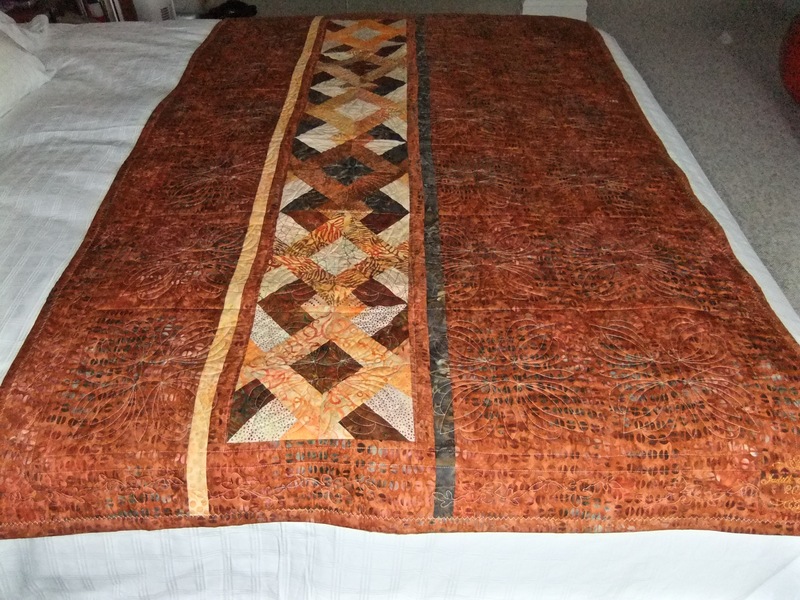 The quilt is based on a three-strip block – in his example, the three strips were all cut 2 1/2″ wide. I adjusted that: two strips were 2 1/2″ wide, the third was 2”. What he did was improvise the middle strip – used a second colour (only) of whatever length to which he added a piece of background to make the strip the same length as the other two in the block. 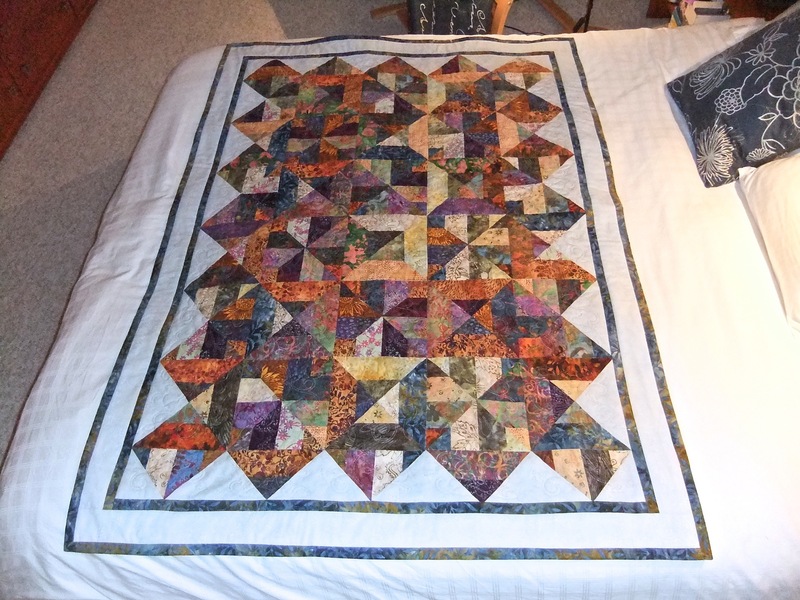 I did the same, most of the time, but sometimes I used the pieced strip on one side. I made 35 blocks, then laid them on the floor and played with the layout. I alternated direction of the blocks – horizontal, vertical, horizontal… When I was done, I pulled three blocks and added in solid blocks – it’s the red one that draws the focus for the quilt. 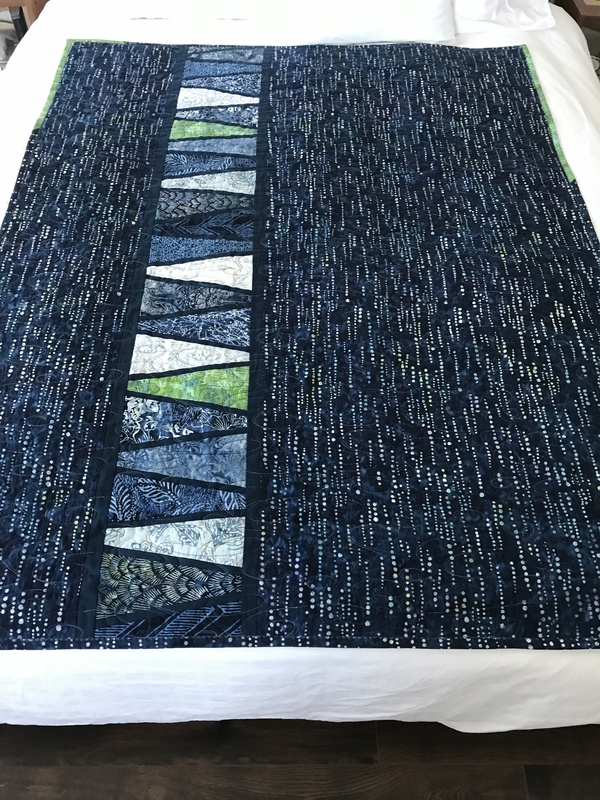 I used leftovers from the Japanese Quilt along with more of the Japanese indigo wax katagami fabric I bought at my local fabric store (meant for garment sewing, but lovely for quilting). I used a second of the indigo wax katagami fabrics for the back, along with leftover blocks from the front. I used a third katagami fabric for the binding with a strip of red batik as an accent. I finished this quilt this morning. It’s based on an idea of Joe Cunningham – Pattern-free quilt making (a Craftsy class) – Fantasy Four Patch. The idea is simple – take two fabrics (one dark, one light), cut 1 strip from each: 5 1/2″, 4 1/2″, 3 1/2″, 2 1/2″, 1 1/2″. Sew them in pairs to make 6 1/2″ strips, then cut the strips: 5 1/2″, 4 1/2″, 3 1/2″, 2 1/2″, 1 1/2″. 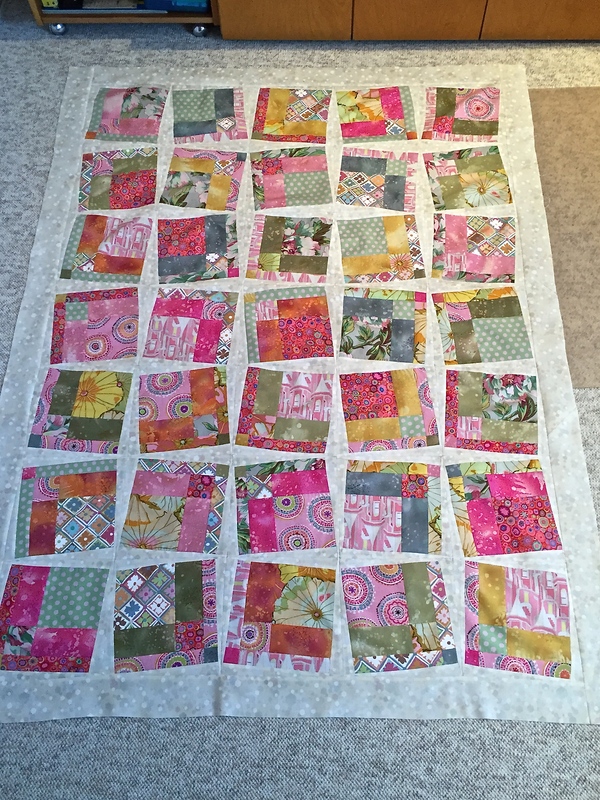 Again, sew together in pairs to make 6 1/2″ blocks! Now start laying them out to make a design pleasing to you – there are no rules here. I wanted a 5 X 7 array so I needed 35 blocks. I could have done a 6 X 8 array which would have needed 48 blocks – you get the idea. This was my idea – to draw the colour concentration from the dark fabric toward the light fabric to get a colour flow. I tossed in three small bits of contrasting fabric to catch the eye. The binding carries on the colour flow extending the dark into the light. Because this is a small quilt (~42″ X 54″) I was able to back it with a single (unpieced) WOF (width of fabric) panel so there’s nothing to show on the back. 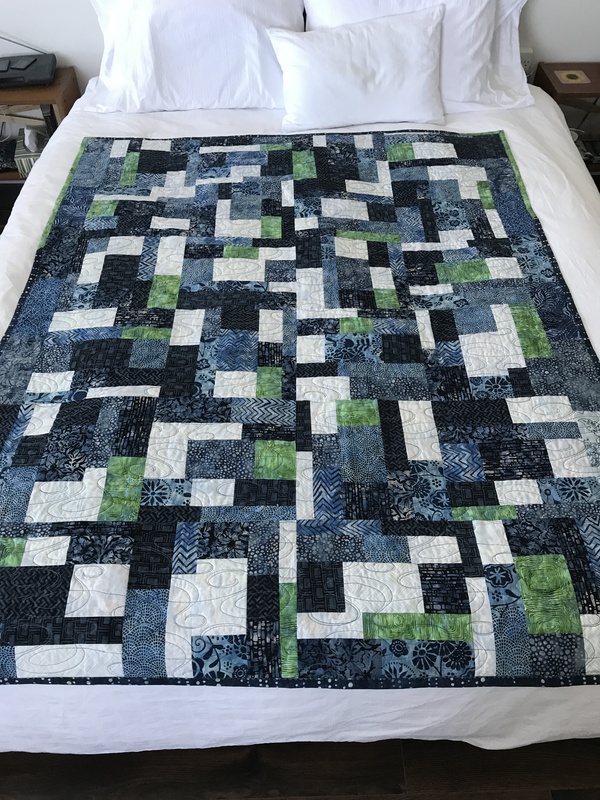 I enjoyed making this quilt. It went very quickly.